What a night. Torrential rain. Flooding in and out of the venue. A support act using the Oedipal curse repeatedly during the final song of their set despite being in a very beautiful house dedicated to a higher power. Was there going to be divine retribution? In a word, no. This was a brilliant, brilliant gig. Curated by the irrepressible Mike Trotman of Empty Rooms – the promoter of choice in these parts – Bennett, Wilson, Poole delivered their album (in order) and then some, in spades. 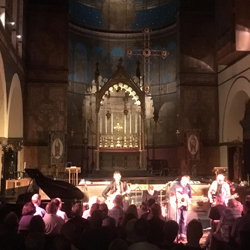 With minimal lighting and PA and a fairly relaxed attitude as they walked on to the stage the three names and their bassist and drummer set up , chatted, said, “Good evening,” and then kicked off. Two hours later there had been chat, Big Star songs and some Graham Nash as well as the whole of the album plus more. 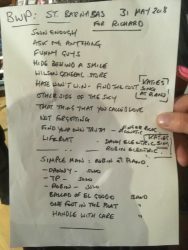 Highlights included Danny Wilson’s requested ‘Track 40′ ( though I didn’t see the card but we saw several others), the Starry Eyed and Laughing song ‘One Foot In The Boat,’ some magical interplay and a genuine sense of three consummate musicians enjoying each other as well as inspiring each other. There needs to be some work done on the mixing of Danny’s lead during the rendition of ‘Lifeboat (Take a Picture of Yourself)’ as it got lost in the mix despite have a tremendous ‘Movie Song’ vibe that the Croz would have proud of. For this reviewer the standout moment came at the end of side one with ‘Hate Won’t Win‘ segueing into ‘Find the Cost of Freedom’. An extraordinary musical moment that will live with this jaded reviewer for a very long time.